This is for "Autumn time" and my sentiment also includes a time reference. I used hand-made paper for the maple leaf ... it's very thin, so I glued it to a piece of white card stock before die-cutting. I then inked the edge of the leaf with gold. I love this paper ... it's so beautiful, but also works for this rustic image, especially paired with the text background and black hemp twine. For the leaves, I misted watercolor paper with water and then added drops of diluted re-inkers (yellow, orange, rust) with my Aqua Painter on top and let the colors bleed into the paper. Once the paper was dry, I stamped my leaves in dark brown and then blended the outline into the leaves using a blender pen. I fussy cut the leaves and then sponged more dark brown around the edges. I will be sharing more DD DT cards over the next several months, but will be including them on posts along with new creations. Thanks for looking! Two beautiful fall creations Loll! These are two fab cards Loll. So glad you're able to share these lovely cards with us Loll. Am looking forward to seeing the rest of your "Collection". I have seen all your DD cards, but any cards by you Loll are worth revisiting and being again Inspired :-). I still Love these goo fall cards. TFS mf. These are so lovely!! Fall cards are my favorite to make and you're making me want to get out my leaf stamps and dies and use some fall colors even though I haven't even started to make spring cards yet. :( I was going to make Easter cards, but thought I had another week so dropped that idea when I realized Easter was this coming Sunday.. I need to get busy with some spring flowers on some cards since I missed getting Easter cards done in time to mail but I just haven't had the energy to craft lately. Can't wait to see more of your DD cards. 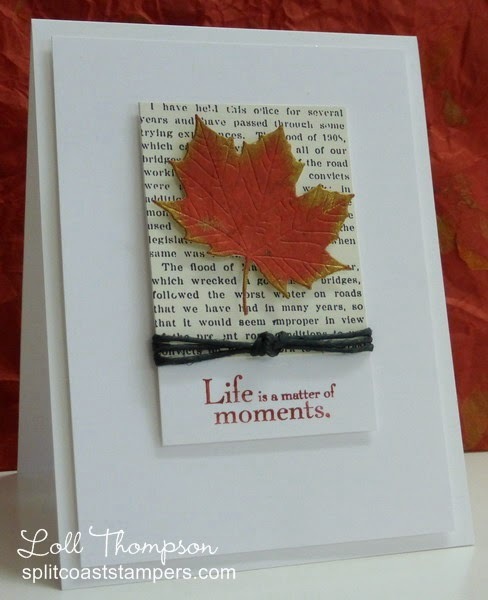 Beautiful cards, Loll - I love the maple leaf against the newsprint. Both cards are really gorgeous, Loll! I love how you inked the leaves and how you added so much dimension with your shading! I'm so glad you're finally able to share them with us...they're beautiful! Two gorgeous cards. You are a master at leaves.